Sara Platt gave us the honor of being our first feature in a new blog series “The CEH: Designer of the Month Spotlight”. We have worked with Sara on many projects over the past four years, and every piece she orders ends up becoming one that we MUST get professionally photographed due to her great eye and signature style. Why do you use CEH pieces in your projects? Because they are original and creative, but also totally current and on trend. I think Justin and Diana create pieces to blend well in any space, but they always end up being the focal point! It's hard for me to resist any flower in a huge bunch, but I would have to say peonies. Maybe because they are hard to find, but also because they are layered and fluffy and perfect. What is your latest design obsession? 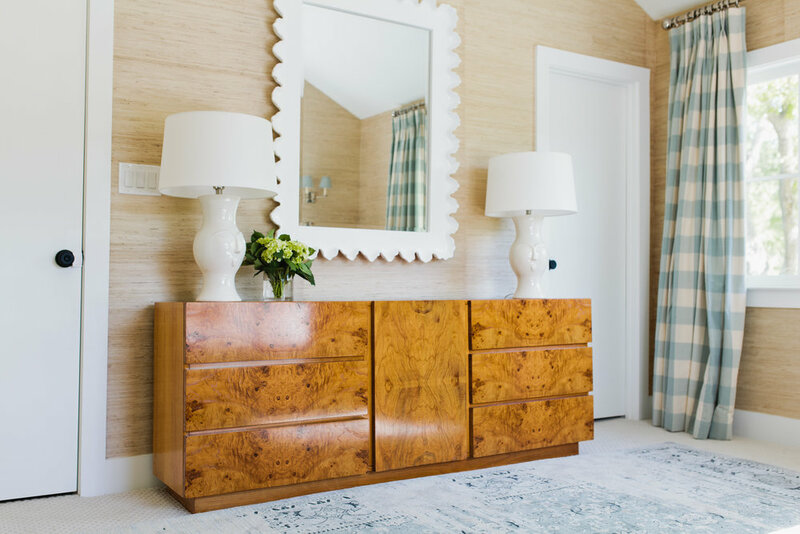 I think I will always be obsessed with wallpaper because I am an 80s baby, but right now I am loving grasscloth furniture and burl. I feel like no room is complete without a splash of each. What do you consider to be a “must have” in a room? A mirror! I feel like they are one of the most basic design elements, but people seem to overlook them. I always have clients going back and forth on art styles, but mirrors will never get old. They double the size of a space and add instant glamour. What determined your passion for design? When did you decide to be an interior designer? I have been rearranging my room since I was in elementary school. It was my favorite thing to do on the weekend. I didn't decide to become a designer until my Sophomore year of college and have never second-guessed that decision. What do you consider to be the most rewarding aspect of your job as an interior designer? There is nothing more fun than a giddy client. Sometimes it's hard for a client to completely envision the space until its installed. Install day is the best. What advice do you have for those decorating their own homes? -Don’t take it so seriously. -Mix high-end with budget items, it helps the high end pieces stand out more. -It takes time, the best spaces are the ones that feel layered and collected. Check out more of Sara's beautiful work by clicking here!